The Grand Canyon's Skywalk has been inaugurated with hundreds of invited guests getting stunning views over the canyon through its glass walkway. Rising 4,000ft (1,220m) from the canyon's floor and 70ft (20m) beyond its rim, the Skywalk is being described as an engineering first. 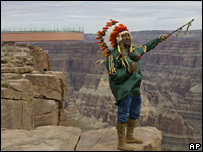 The Hualapai Indians, who own the site, are hoping to attract visitors to a high unemployment area. But some tribal members say this is a desecration of sacred ground. Former astronaut Edwin "Buzz" Aldrin was among the first to go onto the walkway to join Hualapai leaders for a brief ceremony. "I felt wonderful, not exactly floating on air ... but a vision of hope for the future," he said afterwards, quoted by Reuters news agency. The BBC's Andy Gallacher, who also went on the Skywalk, says the glass beneath his feet was so clear it was like walking on a cloud. Sightseers gathered on the edge of the gorge to watch the ceremony. "It's going to go down in the history books but I'm not sure I will walk out on it," said Joan Stewart, a bookmaker from Las Vegas. Construction of the Skywalk began in March 2004 - and will open to the public on 28 March with 120 people allowed on the platform at any one time. Visitors will have to pay $25 (around £13) to use the gangway, on top of the fee for entering the national park. The bridge will be able to sustain winds in excess of 100mph (161km/h), as well as an 8.0-magnitude earthquake within 50 miles (80.5km). 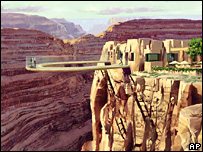 Las Vegas businessman David Jin raised the money to build the Skywalk which was given to the Hualapai in exchange for a percentage of the profits. "When we have so much poverty and so much unemployment, we have to do something," Sheri Yellowhawk, told the Associated Press news agency. Our correspondent says that, for the majority, this is an investment that will bring much needed cash. But some members of the Hualapai tribe have voiced concerns that the project will disturb sacred lands. "When that Skywalk came about it hit me like I was being stabbed," said Dolores Honga, a tribal elder. Would you be brave enough to try the Skywalk?